A sculptor may have used three models, including Myrna Loy, for school's statue. Forget the body-double theory. The statue supposedly depicting actress Myrna Loy that disappeared last year from Venice High School may have been a triple-header. A Sept. 27 story in The Times detailed the mystery of the 83-year-old nymph-like sculpture that dropped from sight a year ago before being found - - discarded and headless - - on campus. 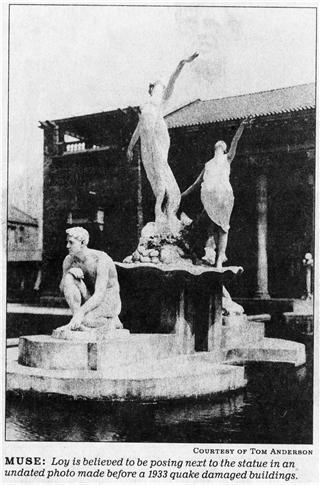 The account included long-whispered suggestions that the statue- might not be a depiction of Loy after all but rather a composite of Loy and a second circa-1920 Venice High student model. Now it turns out that the 8-foot concrete figure could be more of a three-way split. Loy - - known as Myrna Williams when she attended Venice High -- apparently provided the head. Another student, Louise Lynch, may have modeled for the body. And a third student, Frances Reinhart, might have supplied the statue's arms and hands. Relatives of Lynch and Reinhart have stepped forward with clues that could help solve the model mystery. The artwork became known as the "Myrna Loy Statue" in the 1930s, after Loy became famous for her starring role in "The Thin Man" movie series. She portrayed Nora Charles, the wisecracking wife of detective Nick Charles, played by William Powell. But that designation never fazed Lynch or Reinhart, both Venice High graduates. "When I was growing up, Louise would take me over and show me the statue and say, 'A part of me is there,'" said her niece, 84-year-old former 20th Century Fox production manager June Connor Houser. I'd say, 'Hey, shouldn't you get some credit since they used part, of you? Why do you let Myrna Loy take all the credit?' She'd just laugh." Lynch, who lived in Venice and swam daily in the ocean to sooth a severe burn to one of her arms from hot oil, went on to dance in roadshow productions, including "No, No, Nanette." She was a Busby Berkeley dancer at Wamer Bros. when she married studio executive Frank Murphy, who later ran radio station KFWB. Louise Lynch Murphy died in the 1960s and to the very end "seemed quite pleased" that the Venice High statue was prominently displayed in front of the school, said Houser, who lives in Port Hueneme. Reinhart was also proud of her role in the sculpture, said Joel Softer, a grandnephew. "She said she was asked to pose by the art teacher," said Softer, of Long Beach. "I remember going to see the statue with her and her husband about 30 years ago. They made a point of driving past there and showing me." Reinhart and husband Joseph Goldsmith operated Long Beach's Savitz's Just Good Food restaurant for decades. She died in 1987. "She had very long. elegant-looking hands. Until her death she was proud of her hands and got a manicure every week," Soffer said. "She sort of laughed at Myrna Loy getting all the credit for it. But they would never have called it the 'Franky Goldsmith Statue.'" Venice High alumni say they plan to restore the statue, originally sculpted by art teacher Harry Winebrenner. The nymph figure was accompanied by two kneeling figures, which were modeled by students Iva Worsfold and Doug Armstrong, according to readers Jonathan Weiss and Bill Priester. Winebrenner is known, to have created several versions of the nymph figure and to have carved a separate bust of Loy. He died in 1969. Loy died in 1993 at age 88. In a 1988 autobiography, Loy recounted what she called "hours of rigid posing" for the statue as Winebrenner "draped my body with wet cloth and gauze." Winebrenner's daughter, Alice Winebrenner Parshall, is a 90-year-old Santa Barbara resident who is hospitalized. A friend, Rita Ferri, said Parshall was confident that the Venice High statue was intended by her father to depict Loy. "She said Myrna posed quite a bit for her dad. She would always come by the house with her mother and brother," Ferri said. However, "Alice said the house was always filled with students. There were always high school kids coming in and out." Parshall told Ferri: "Now that my father and Myrna are gone, it seems like everyone is trying to claim they had a 'part' of the statue."